The PharmaCeiling panelized system is designed as a flush ceiling system which provides end users and owners with the ability to access the area above the cleanroom for mechanical services or walk-on capabilities for maintenance access when applicable. 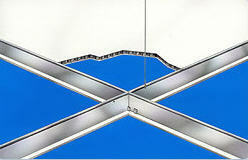 The PharmaCeiling System is a 2" thick composite panel using a steel skin on both sides of an aluminum honeycomb core. Ceiling panels utilize a smooth unplasticized PVC finish which allows panels to be chemically welded to one another forming tight, straight-line bonds between adjoining panels and beams. Additional finishes are also available. The unique design of the ceiling allows the additional benefit of incorporating flush lighting, filters and other ceiling mounted equipment. 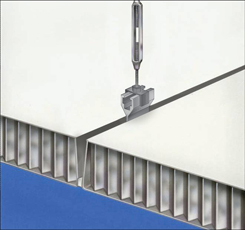 The PharmaCeiling System is supported at intermediate points with threaded rod to the existing building structure minimizing the need for catwalks above the cleanroom areas. The PharmaCeiling System can be supported from our free-standing "envelope" structures in applications where the existing building cannot support the design. 2" Gasket Grid - Combines flexibility with simplicity to meet the ever-changing needs of the technology industries. The system offers the complete versatility of non-progressive construction required in most cleanrooms. It is a functional stick-built system that provides a 2" wide structural grid system with aluminum extrusions and zinc die castings to receive standard filter modules, light fixtures and blank ceiling tiles. Truly an engineered system for ease of installation, the system can be used in 2'x2', 2'x4', 4'x4' and custom layouts. 1 1/2" Gasket Grid - The perfect solutions for diverse applications including pharmaceutical, microelectronics, aerospace, food processing, and hospital industries. The gasketed grid is designed with a 1 1/2" face tee to support HEPA filter systems and light fixtures. 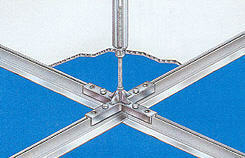 Installation is simplified with a clip assembly requiring no special tools for the attachment of grid components. Choose from a wide selection of module sizes such as 2'x2', 2'x4', or 4'x4'. Available in painted white and clear anodized finishes.